Elise is 2 and a half now and has really started to enjoy playing with toys that she can create little stories with. 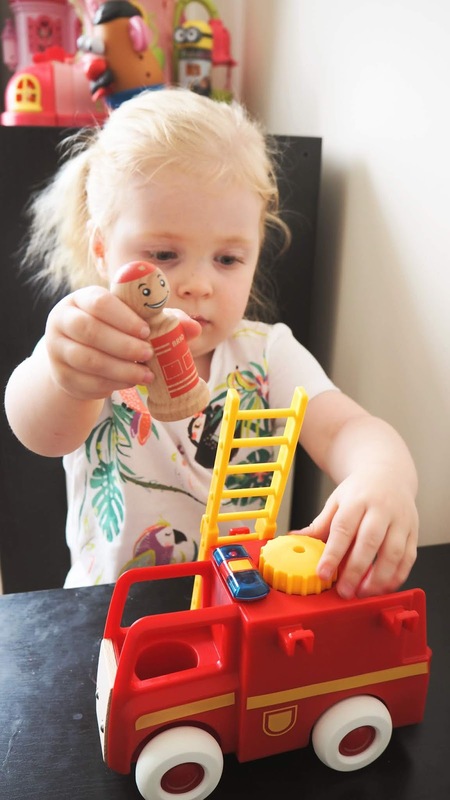 Whether she is playing with Duplo, Happy Land or simple wooden toys, she loves to create her own little world and creates whole story lines for the toys she is playing with. When we were asked if Elise would like to test out the Brio Light and Sound Fire Truck, I knew that she would love it. 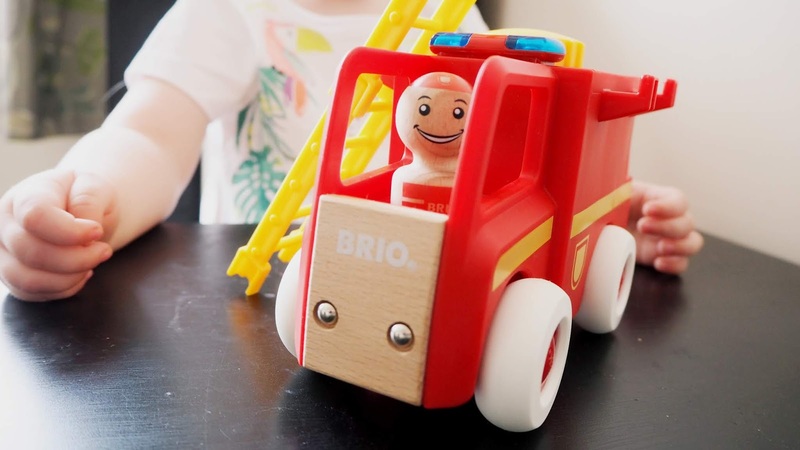 We already have the Brio My First Take Along Set and love the Brio range of toys, especially as we are huge fans of sustainable wooden toys. Recently, Elise has taken a great interest in the Emergency services, and so she was very excited when I opened up the Light and Sound Fire Truck for her. She immediately pushed the button on the top to activate the fire engine sound, which isn't too loud and only plays for a short time, and started setting up the ladder for the firefighters to rescue a cat stuck in a tree. My first impressions of the toy were also great, and I loved the mix of plastic with wood, and the simplicity of the wooden characters. 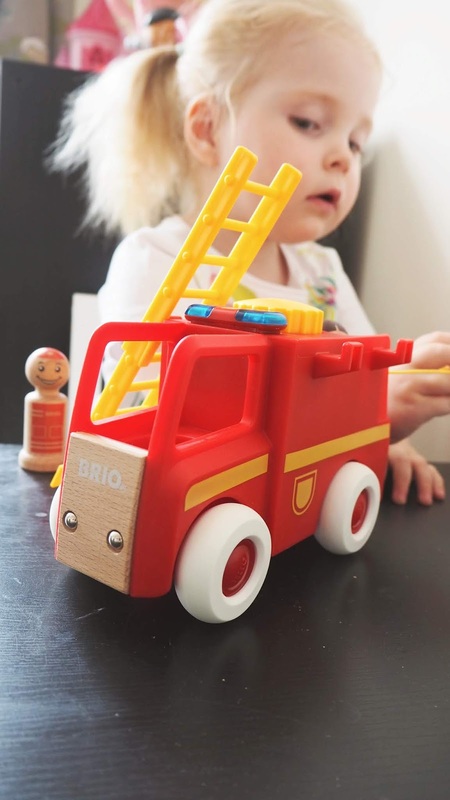 The Light and Sound Fire Truck is part of the My Home Town range from Brio and is suitable for children aged 18 months+. The set doesn't have any small parts, and all of the parts are easy for little hands to grab. With a working siren that is activated with a simple push button on the top of the vehicle, a hose and a removable ladder, it is pretty accurate to a real life fire truck. It also comes with two wooden fire fighters to create stories with, and to save the day. The wooden people can also be used in other Brio toy sets, and the main vehicle does have magnets on the front to be used with other play sets too. The set retails for £24.99, and although I originally thought this was a bit high, the quality of Brio toys really is outstanding. The plastic parts of the toy are nice and thick, and the wooden elements really do add a little something extra. Plus the fact that they use wood adds a timeless element to their products. I am not a fan of having plastic everywhere, and although Elise does have plastic toys, we do mostly buy wooden toys for her, or purchase toys from charity shops. I would happily pay this price tag in the future for other items in the range. Elise was excited about the fire truck as soon as she saw the box. As I said, she is really interested in the emergency services lately, especially after a recent trip to the hospital. As soon as I put it in front of her, she pushed the button to activate the sirens and took both people out of the truck. It didn't take her long to figure out that you can wind up the hose, and remove the ladder from the side of the truck. She even managed to balance the ladder on the side of the truck so that she could make the people climb onto the top. 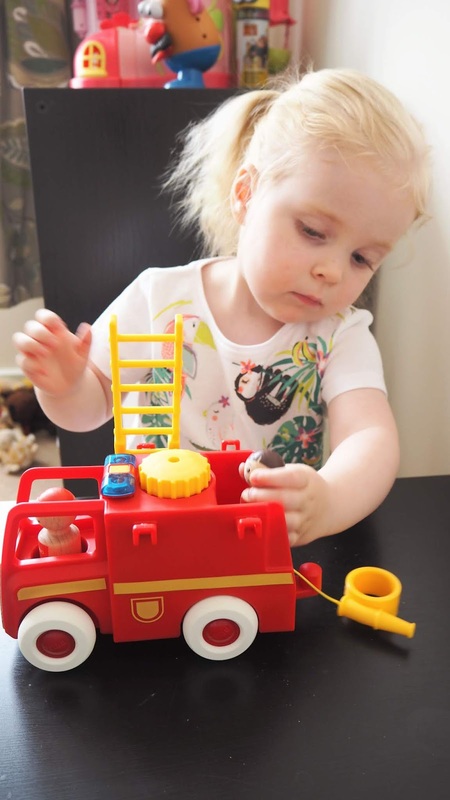 She has loved mixing the truck with her other toys, especially her Duplo and saving animals from trees, as well as fighting fires. It is perfect for her age, and I can see that she is going to get plenty of use out of the truck in the future. As the truck isn't too large, we have also been able to take it out to entertain her whilst waiting in a restaurant and the doctor's surgery, which she was very pleased about too. She can often be found with one of the people in her hands too! We genuinely love this product, and the Brio brand. Although the price tag can seem high for the items, the quality is amazing and these toys will long outlive Elise's cheaper toys. She also plays with her Brio toys more than the cheap plastic toys that she has. This has definitely been a go to toy for the last few weeks, and I can't see her getting bored of it any time soon. I wouldn't change anything about the truck as I think it has all the basic elements that is needed, and the fact that the battery is included is a huge bonus! You can purchase the Light and Sound Fire Truck from the Brio website, Amazon and any great toy store!